Palm Sunday this year surprised us all with a spectacular snowfall. 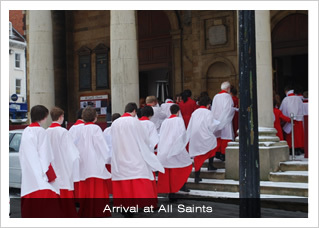 Whilst churches and Cathedrals across the country were forced to cancel services due to the weather, service at All Saints continued as usual! 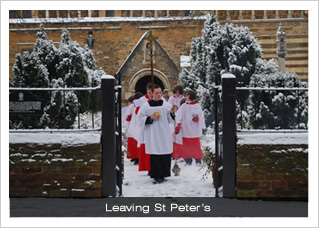 As though the additional challenges posed by the snow were not enough, the services at All Saints were scheduled to begin at St. Peter’s – and continue at St Peter’s they did! 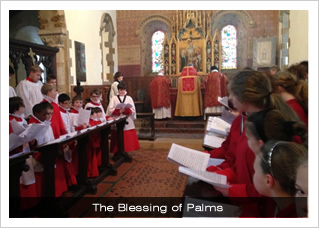 St Peter’s is our sister church, included in the parish of All Saints with St Katharine & St Peter in Northampton since 1998, and designated Grade 1 by English Heritage. The stunning early 12th century church has been in the care of the Churches Conservation Trust since 1998, and they have restored the church so that its architecture, decorations and furnishings can now be fully appreciated. One downside of such an historic building is that it does not have the modern comforts we have come to expect – comforts such as heating! However, with the full choir of boys, girls and men, plus most of the congregation, the snug Norman church was soon full to bursting and quickly warmed up. 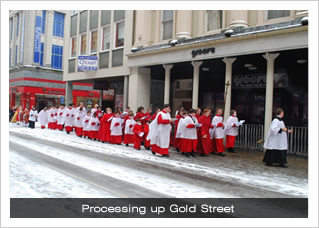 Following a short service following the Liturgy of the Palms, at which the palms were blessed, the choir and congregation processed up a very snowy Horsemarket, moving into Gold Street, before arriving at All Saints where the service continued with High Mass and Liturgy of the Passion. That evening, the choirs gave a liturgical performance of John Stainer’s magnificent Crucifixion, given at 6:00PM in place of Evensong. Joined by additional singers from across the county, this splendid work of Victoriana is ever-popular, and the congregation joined in the hymns with gusto, more than making up for the snowy weather outside. And so began the week of preparation for Easter.